I arrived into the Cameron Highlands the day after the start of my solo asia travels- a day that did not go so well… Thankfully, this day went much better, though not without its hiccups. 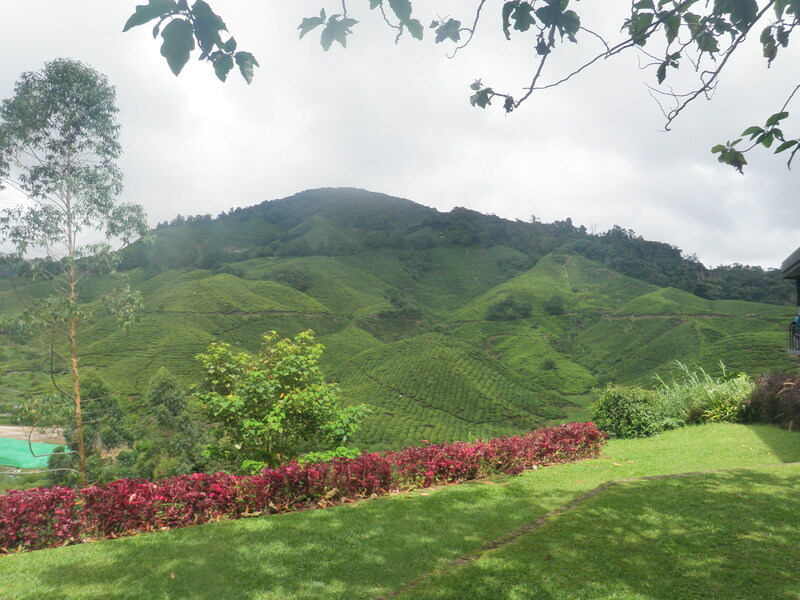 I had no problems getting the bus to the Cameron Highlands and was excited as we glided past rolling hills and beautiful tea plantations. When I arrived and stepped into the town, it was just a matter of finding my hostel. I asked a couple people and was quickly directed. When I rocked up to the reception however, they couldn’t find my reservation! PERFECT! JUST what I need after a previously horrible travelling day where the same thing happened! Before the fury started to unleash however they hastily explained that it was a mistake on behalf of their booking system and they do have a bed available for me…down the road. DOWN THE ROAD!? They explained that down the road was a partner hotel of theirs and they would arrange for me to have a private room for the night and then I could be moved into the dorm the following day. OH….um…ok…YES!! SWEET! The next morning I arose bright and early, refreshed and rejuvinated, and joined up with a day trekking tour. One of the highlights specified in this tour was seeing the worlds largest flower (technically a mushroom) which was pretty cool in itself. The trekking however was wonderful- exhilarating, challenging and enjoyable with a great group of people and nice ( if not slightly casual ) guides. We got caught in the pouring rain just as the trekking was just finishing up- but hey thats South East Asia for you! I had a really enjoyable evening that night meeting up with some people from my tour for a large group Malaysian meal and then back to the hostel for beers and campfire time! Can you believe most of the people there didn’t know what smores where!? well I quickly corrected that situation and bought a large bag of marshmallows to share with the group. There’s nothing like exchanging travel stores around a fire, in a hostel, with smores…it was near enough to a perfect travel evening. The second night involved introducing a new group of people to my famous smores and more travel tales shared around the campfire. It was an early night for me however as I wanted to get a good night sleep before i the long journey to the centre of the rainforest, Taman Negara the next morning! I was also planning to wake up super early and catch the live streaming of my little brother’s University Graduation! Wow- what an amazing thing the internet truly is. I just used the public computer in my hostel, which was skipping and pausing and slightly blurry but I still managed to watch my brother walk across the stage – live- to accept his Bachelors of Arts Degree (with distinction!). I was sobbing and smiling and wishing I was there in person but absolutely thrilled beyond words to feel connected with my family and that I was sharing some small part of the experience with him. Myself and Matt, a fellow traveller who decided to join me, boarded a bus to Taman Negara right after and headed into what turned out to be one of my favourite spots in the whole of South East Asia..to read about my experience in the world’s oldest rainforest click here!